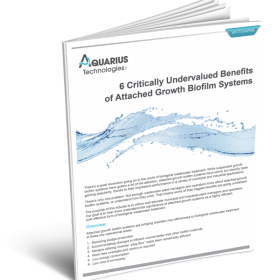 6 Critically Undervalued Benefits of Attached Growth Biofilm Systems - Aquarius Technologies, LLC. Don’t miss the opportunity to understand more about the quiet revolution going on in biological wastewater treatment. Municipal and industrial plant managers and operators, this is a must-read! Get Inspired – Find out new ways to reduce sludge production, lowering your removal costs. Rethink – Discover designs that utlilize modular “plug flow” making them remarkably efficient. Knowledge is Power – Discover ways to lower your energy consumption and lower your cost of ownership.